I am an artist living in Buxton where I have my studio. My interest is in mixed media, abstract art. My work is inspired by two experiences. How I see and experience the world around me. The shapes and forms that are present in nature and the history and archaeology left by people. I am particularly interested in how we have interacted with our surroundings in the forms of the structures we have built. I am interested in the history of a place and multiple levels that can be found around us. Secondly, I’m fascinated by layers in how we experience. In looking at a piece of art no two people will bring the same meaning to it, as our own experiences are multi layered. 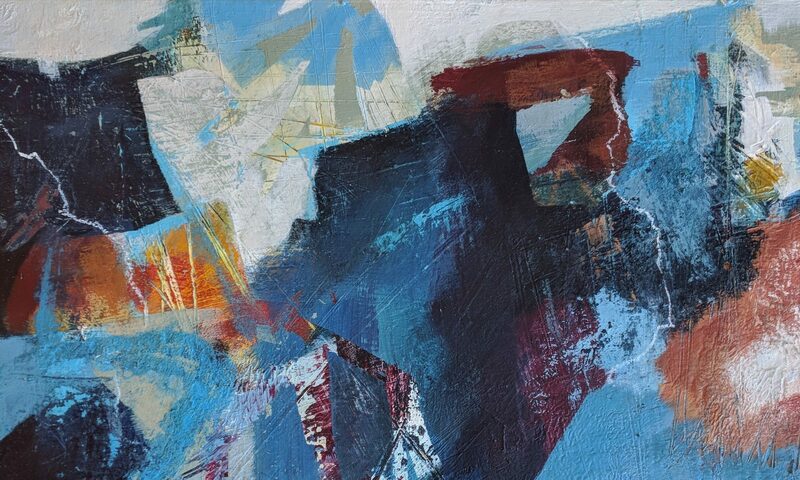 I look to bring some of the nature of this to my work in the levels of collage, paint and the history of the development of the painting which can be seen in the marks and texture. I have been painting consistently for about the last 8 years this began with a holiday workshop in the Isles of Scilly. It rekindled my love for art following a long gap whilst I was developing my career as a psychotherapist. I had reached a point of recognising that whilst I do find my therapy work to be creative I began to feel like I wanted a different experience in my life and that that I wanted to express my creativity in other ways. Over the last eight years I have undertaken workshops with a variety of artists, explored new techniques and materials through reading. My paintings reflect my expanding interests. I moved from painting in oils, to using acrylics, and then to mixed media. Throughout this time there has also been a movement towards firstly loosening up as an artist, and them becoming increasingly interested in abstraction which is where I have found my home.